Hi everyone, this is Heather again, here to tell you about the newest excitement at one of our local theme parks. Busch Gardens Tampa Bay will introduce a brand new attraction that will feature a Sesame Street-themed play land featuring Big Bird, Elmo and the rest of their gang. 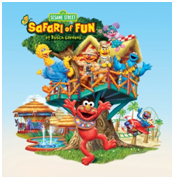 Sesame Street Safari of Fun is a one-of-a-kind destination for family-friendly entertainment. This attraction will showcase the spirit of Africa throughout the rides, shows and play areas. Sesame Street Safari of Fun will include several rides, featuring a junior roller coaster, “Air Grover,” which is perfect for parents and children to ride together while they twist and turn through the Sahara. “Zoe-Patra & the Hippos of the Nile” is a flume ride that will send guests splashing through the river. Kids can also soar over the African canopy on the “Rosita’s Djembe Fly-Away” swing ride. Additionally, families and kids can enjoy “Elmo’s Safari Go-Round” carousel and fun-filled, action packed water play areas. To unwind from all of the fun and excitement, guests can enjoy breakfast and lunch with Elmo and friends on select days at an outdoor dining facility adjacent to the attraction. There will also be a photography studio to enhance the experience by allowing kids to capture a fun moment with their favorite pals. In addition to the rides and play areas, families can be entertained on the big screen by watching “Sesame Street presents Lights, Camera, Imagination!” on a 4-D theatre located in the park. 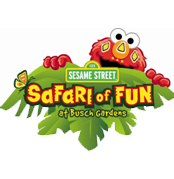 Sesame Street and Busch Gardens have joined together to create a signature attraction that is sure to lure guests of all ages. To check out more information about Busch Gardens Tampa Bay or the upcoming Sesame Street Safari of Fun, please visit www.buschgardens.com, and stay tuned for updates on Tampa Florida attractions and things to do in Tampa Bay!